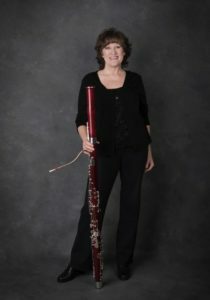 Jill has been a member of Folsom Lake Symphony since 2009 and performing as principal bassoonist since 2010. She began playing the bassoon at age 16, after previously playing the tenor saxophone. She attended Oral Roberts University for her Bachelors of Music, studying bassoon with Heather Graham of the Tulsa Symphony. She then earned her Masters of performance degree at North Texas State University, studying with professor Sue Schrier of the Dallas Symphony. While in Texas, she played with various orchestras, including Nacogdoches Orchestra and Wichita Falls Symphony, as well as playing in many chamber groups such as woodwind quintets and bassoon quartets. When she moved to California, she played with the Berkeley Opera Orchestra for a time, and then moved to the Sutter Creek where she also plays with the Motherlode Friends of Music Orchestra. She works as a medical transcriptionist/editor at the hospital in her area, and when she is not working or practicing bassoon, she is either running, gardening, playing with her four grandchildren or chillin’ with her husband.